One of the great things about my wife's pregnancy is that she's been getting cravings for Western food, which normally she can happily live without. This prompted her to start searching for Heinz beans, or 'Beanz' as they prefer to call them these days for the benefit of Generation-Y. Here, far out in the uncharted backwaters of the unfashionable end of the western spiral arm of Busan, I've only seen an actual can of baked beans once - it was allegedly the product of an Italian brand I'd never heard of, and it was too salty. So I didn't think my wife's quest specifically for Heinz beans was going to be successful, but she found some on the Internet. Considering that, as far as I recall, a pack of four tins of 'Heinz Beanz' in the UK used to sell for around £1.40 (2,402 won/$2.13), at 13,660 won for six (£8/$12) delivered, the Korean price was not cheap, although since they were not quite the classic product but instead 'ham sauce' and 'sweet chilli' flavour, it wasn't exactly comparing like with like. Clearly though, it was very expensive, but for the sake of the craving and that little reminder of home, we ordered them. 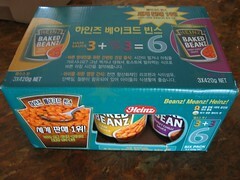 This being Korea, the beans turned up the next day, by which time my wife's few-day old craving had passed. The spiciness of the sweet chilli beans made wonder how they hadn't yet caught on in modern-day Korea, given that Koreans actually eat a lot of beans of the non-baked variety. Then again, the red beans which are so popular in Korea are believed to cast out bad spirits, but I don't believe Heinz Beanz have the same effect. Later, friends of ours reported discovering the same product in the Busan branch of Costco, which unfortunately is too far away from us to shop at. The cost there is 9,990 won (£6/$9). They bought some for us and we gave them a tin of the sweet chilli beans guessing that these would be best suited to the spice-craving Korean palate. It proved to be a hit. I have a couple of cans of regular baked beans specially brought over from England...I've not seen them in Seoul but they must be available cos I've had them in several restaurants and they were definitely not those terrible Italian ones. Our local GS supermarket stocks an imported generic brand. I snapped them up as soon as I saw them, even though I hated eating them as a child. Now though, I've discovered a newfound appreciation for the critters.